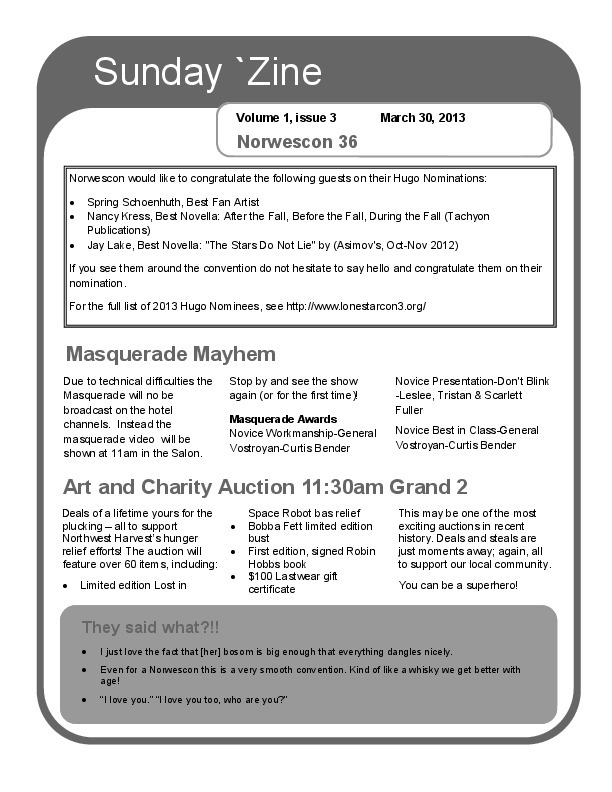 Daily informational bulletin for Sunday of Norwescon 36. If you see them around the convention do not hesitate to say hello and congratulate them on their nomination. Due to technical difficulties the Masquerade will no be broadcast on the hotel channels. Instead the masquerade video will be shown at 11am in the Salon. Stop by and see the show again (or for the first time)! This may be one of the most exciting auctions in recent history. Deals and steals are just moments away; again, all to support our local community. I just love the fact that [her] bosom is big enough that everything dangles nicely. Even for a Norwescon this is a very smooth convention. Kind of like a whisky we get better with age! "I love you." "I love you too, who are you?" The Norwescon 36 Art Show is proud to announce this year's winners and would like to thank all of our artists for their outstanding contribution to this year's show. Best in Show — Lee Moyer: "Theora"
1st place — Stephanie Pui-mun Law: "Firefly Hunters"
2nd place — Heather Hudson: "Out of the Closet"
3rd place — Theresa Lee Halbert: "Guardian of Avalon"
Best Color — Mark Tedin: "Chaos Orb 2013"
Best Black & White — Julie Baroh: "Faerie Wasponry"
Best Mixed Media — Michael Duquette: "Nazca Machine"
Best 3D — Gabe Marquez: "Uberlopz"
Best Textile — Sandfra Ackley: "The Navigator"
Best Jewelry - Squirrel: "Naboo"
Best of Show — Lee Moyer: "Theora"
Best Humor — Robin Kaplan: "Tea Rex"
Best Fantasy — Aimee Stewart: "The Dreaming Tree"
Best Horror — Cat Grey: "Robert"
Best 3D — Butch Honeck: "Teeter Totter Twins"
Best Jewelry — Katherine Howes: "Weeping Garden"
We would also like to thank this year's panel of judges Betty Bigelow, Don Lacky for their generous time and knowledge in helping judge this year's show. Our final panel of Movie News & Previews will start right after the Fandance Film Festival at 2pm and run until 4pm in Evergreen 1-2. Tech has worked hard this year to make the screen bigger and the sound better, come see their solution. If you haven't seen the latest from Hollywood, drop on by - for the swag and be ready for "why? Why? WHY?" Norwescon is a fan-run convention and we are always looking for good people. Planning for the next convention starts in the summer months with the new exec team being selected in June. If you saw something you liked or didn't like this year please let us know. If you are interested in joining the convention committee or being a professional panelist now is the time to throw your hat into the ring. We re collecting ideas for next year and planning on how the convention can become just that much more amazing. Norwescon 37 will, once again, be held at the DoubleTree by Hilton Hotel Seattle Airport. You will be able to reserve your room after April 18, 2013. Stay tuned to the Norwescon website www.norwescon.org for more information as it becomes available. Updates will also be included in our monthly eNewsletter. “Norwescon 36 Daily 'Zine (Sunday),” Norwescon History, accessed April 19, 2019, http://history.norwescon.org/items/show/185.